Daodejing is the foremost important ancient text for the Dao school in China. Laozi is well known for his advice of Wuwei無為 ("actionless") and that of "Not Daring to be the First in the World" (不敢為天下先). But these advices, along with others, have frequently been misunderstood. Prof. Ho, who had translated the Daodejing into English, offers an alternative interpretation to some of Laozi's teachings. 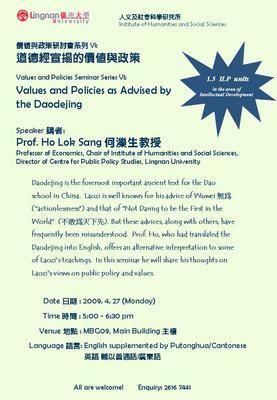 In this seminar he will share his thoughts on Laozi’s view on public policy and values.